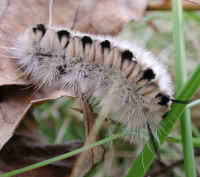 (Hickory Tussock Moth - 1) During one of our walks, we encountered this Hickory Tussock Moth caterpillar crossing the road. We gently relocated him or her (we couldn't tell which) to the other side of the road where we took these photos. 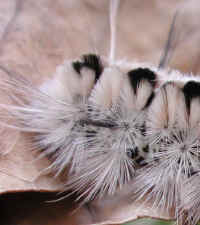 The actual size of the Hickory Tussock Moth caterpillar is about one inch long. (Hickory Tussock Moth - 2) This Hickory Tussock Moth caterpillar seemed to be a little shy and kept moving while we were taking these photos. 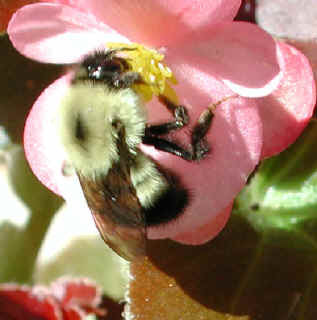 It is most commonly seen from June through September. 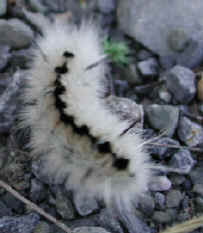 (Hickory Tussock Moth - 03) While we were walking along the road, we saw this Hickory Tussock Moth caterpillar also walking on the road. We were concerned that he or she might be run over and killed, so Mary put her hand in front of the Hickory Tussock Moth caterpillar, and he or she climbed on her fingers, so she could carry the caterpillar to a safe place on the side of the road. 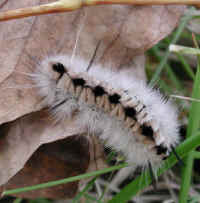 (Hickory Tussock Moth - 04) After our assistance in crossing the road, the Hickory Tussock Moth caterpillar immediately began walking over the fallen leaves and grass. 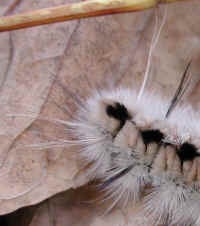 (Hickory Tussock Moth - 04a) In this close-up photo of the Hickory Tussock Moth caterpillar, we can get a better look at the tufts of hair, and particularly the longer white and black tufts. There seems to be something, which we could not identify, on the Hickory Tussock Moth caterpillar's back between the 1st and 2nd black spots (from the right of the photo). 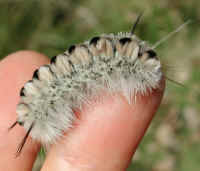 (Hickory Tussock Moth - 05) The literature says that the Hickory Tussock Moth caterpillar can grow to an approximate length of 1-1/2 inches; however, the one in this photo is somewhat smaller. (Hickory Tussock Moth - 05a) In this close-up side view of the Hickory Tussock Moth caterpillar, we can see the formations of the tufts of hair, and the way the longer tufts grow from the center of other tufts. After we took this photo, we continued on our respective walks. � 2002-2003 - The Mary T. and Frank L. Hoffman Family Foundation. All rights reserved. May be copied only for personal use or by not for profit organizations to promote compassionate and responsible living. All copied and reprinted material must contain proper credits and web site link www.all-creatures.org .